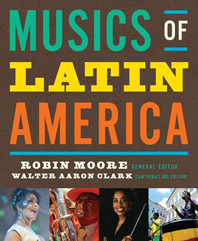 The most up-to-date and comprehensive Latin American music survey available. Covering one of the most musically diverse regions in the world, Musics of Latin America emphasizes music as a means of understanding culture and society: each author balances an analysis of musical genres with discussion of the historical and cultural trends that have shaped them. Chapters cover traditional, popular, and classical repertoire, and in-text listening guides ensure that students walk away with a solid understanding of the music.